Over the past 40 years (1977 to 2016), S&P 500 has had inflation-adjusted annualized return rate of 7.20%, that’s having dividends reinvested. That means $1 grew to $16.14. 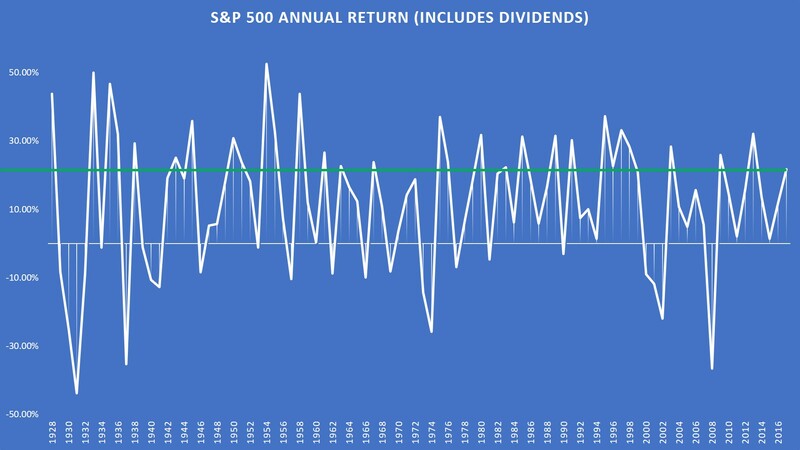 Without dividend reinvestment, S&P 500 has had annualized return of 4.12%, which means $1 grew to $5.02. Can you see the power of time and compounding? I hope you see it. Let’s assume you’re 20-years-old, saving $1,000 each year for the next 40 years. When you’re 59, you will have $40,000 in cash. That is considering zero inflation. Now, let’s assume you invest in the market that will give you inflation-adjusted annualized return of 5%, without dividends. When you’re 59, you will have $97,622.30. Lastly, let’s assume you invest in the market that will give you inflation-adjusted annualized return of 5%, with 1.5% annual dividend. When you’re 59, you will have $141,731.09. Oh My God! The Power of Time and Compounding! If you want to invest, invest now. Don’t let all-time highs scare you. S&P 500 is currently yielding 1.93% dividend. Since the late 1800s, the lowest dividend yield was 1.11% in August 2000. The average dividend yield is 4.38%. The returns you see above and below are before taxes. Tax laws might be different in 2056. 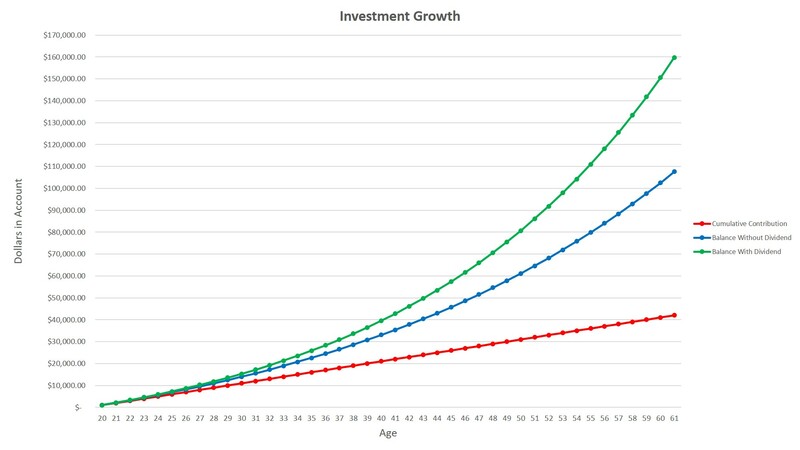 In this post, I will outline some of my plans to be a very long-term investor. I’m mostly trader and investor with less than the 5-year horizon. Over a year ago, I tried to open a ROTH IRA (retirement) account. After filling out the answers to countless questions, the application asked me to provide a proof of income. At the time, I did not have a job. So I just gave up on the application and did not think about it until last January. What can I do to save more? What are the non-mandatory expenses? One of the ways I can save more is, believe it or not, recycling bottles/cans (I don’t consider it income). In a family house of 6, we drink a lot, especially water. I drink about 12 bottles of water a day….using the same bottle. I fill the bottle with boiled water. Others just waste the bottles. I rather profit from people’s mistakes. All those bottles collected in about two weeks made me $5.65, worth almost 6 pizzas, 2 each day. Or 6 yogurts, 3 each day. If I make $10 every month for two hours of work, I can make $120 a year. That money can add up over the long term once invested in dividend-yielding ETFs. I will not continue collecting bottles/cans (side hustle) once I get a full-time job/live on my own. I’m doing this now because I don’t even do my own laundry….yet. I also figured out the non-mandatory expenses to cut back on, specifically on “ex”-food items I used to buy on a pulse. Small purchases (gum, candy, etc), for example, can add up over time. Those purchases are paid in cash. Well, I don’t carry a lot of cash. I carry reasonable amount. How you define ‘reasonable’ is up to you. 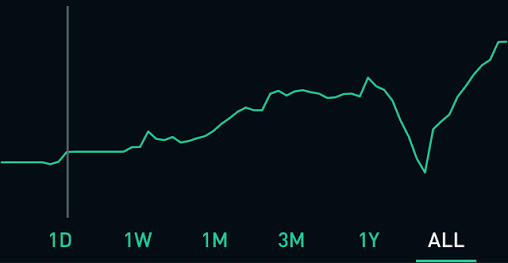 In January and February, I decided to open multiple accounts to keep my cash, rainy day savings, investments and deposited more money into my Robinhood brokage account. Why multiple accounts? Because I don’t trust FDIC, which “protects” or “insurances” depositors to at least $250,000 per bank. I’m paranoid someday FDIC won’t be able to protect every depositor, after a major hack or something. Who knows, it might even take a long time to get depositors’ money back. What if I lose my debit card? I wouldn’t want all/most of my cash in that account. At most, I keep 30% of my cash in the checking account. Now, my cash and short-term securities (stocks, etc) are diversified among multiple accounts. Besides the savings account (almost 1% interest), I opened two more investments accounts. These accounts are different than Ameritrade/Robinhood. The first account is Acorns, an investment app that rounds up user purchases and invests the change in a robo-advisor managed portfolio. For me, there’s no fee since I’m a student and under 24. I don’t trust robo-advisers, but this case is different. There are only 6 ETFs which I have looked into and decided they were good for the long-term in a diversified portfolio. 75% of its users are millennials. 79% of millennials are not invested in the stock market. I find that as a real concern. The second account is Stash, an investment app that allows users to pick stocks in themed based investments around wants (Clean & Green, Defending America, Uncle Sam, etc). This app is also targeted toward millennials. Unlike Acorns, Stash charges you even if you are a student. But, the first three months are free. Like Acorns, Stash has a subscription fee of $1 per month for accounts under $5,000 and 0.25% a year for balances over $5,000. Studies show 48% of Americans cite a lack of sufficient funds as their main barrier to investing. Luckily, technology is transforming the way people invest. Start small. Before you know it, it is big. Both of the micro-investing apps are like savings/IRA accounts for me since I can grow my portfolio through dividends. I have checked out the ETFs Acorns invests in, they are good. I have checked out the ETFs Stash offers. Most of them are good. I have invested in the stable ones with low expense ratio relatively to its dividends. Unlike ROTH IRA, I will need to pay taxes on realized capital gains, dividends and income interest. Whopping 69% of Americans have less than $1,000 in a savings account and 50% of them have $0 in that account. All these people playing Candy Crush should be thinking about their future. Be a Robo-Saver and Be a Robo-Investor. Note: All of my $$$ comes from off-book jobs, scholarships, prizes, and living under mommy and daddy’s roof (Can’t wait to move out). This post doesn’t mean I will stop trading. 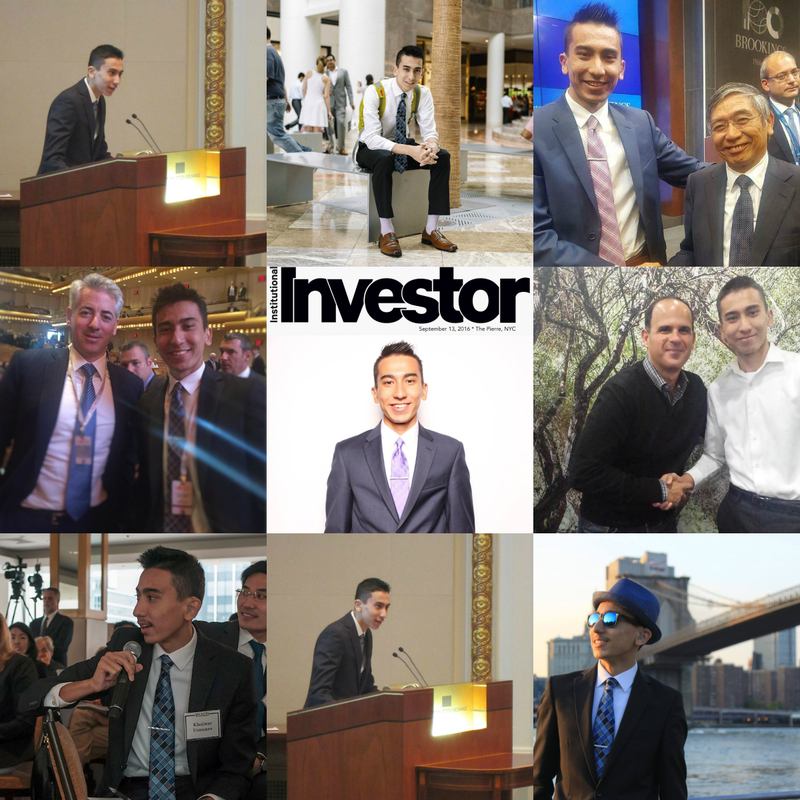 I will continue to trade forex, stocks, and commodities. Yes, I know markets have been rallying and S&P 500 has been hitting all-time highs. But, remember Brexit? In case you forgot, the people of United Kingdom voted to leave European Union on June 23rd. Markets then destroyed more than $3 trillion in paper wealth in the next 2 days (Friday and Monday). The actual businesses and people in the UK just cannot shake, shake, shake, shake, shake,….it off. The UK job market went into “freefall” as the number of people appointed to full-time roles plunged for a second successive month in July, according to a survey. 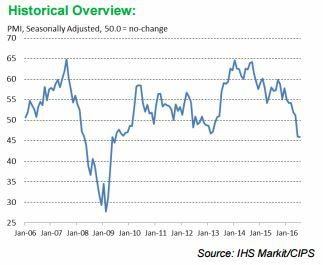 An index of permanent positions dropped to 45.4 from 49.3 the previous month, the lowest level since May 2009. A number below 50 indicates a decline in placements (contraction). Employers in the survey cited Brexit-related uncertainty. The same uncertainty that scared away some investors and sit on cash, including me. 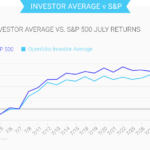 91% of investors made money in July as US markets kept hitting record highs, according to Openfolio, an app that allows you to connect and compare your portfolio to 60,000 other investors. 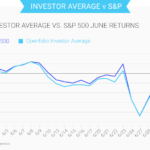 Average cash holdings of these investors grew 25% over the past three months leading up to July. As a bull market continues, almost anything you buy goes up. It makes you feel that investing in stocks is a very easy and safe and that you’re a financial genius. 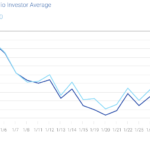 93% of investors lost money in January as the energy prices plunged and uncertainty in China scared investors. As a bull market turns into a bear market, the new pros turn into optimists, hoping and praying the bear market will become a bull and save them. But as the market remains bearish, the optimists become pessimists, quit the profession, and return to their day jobs. This is when the real professional investors re-enter the market. 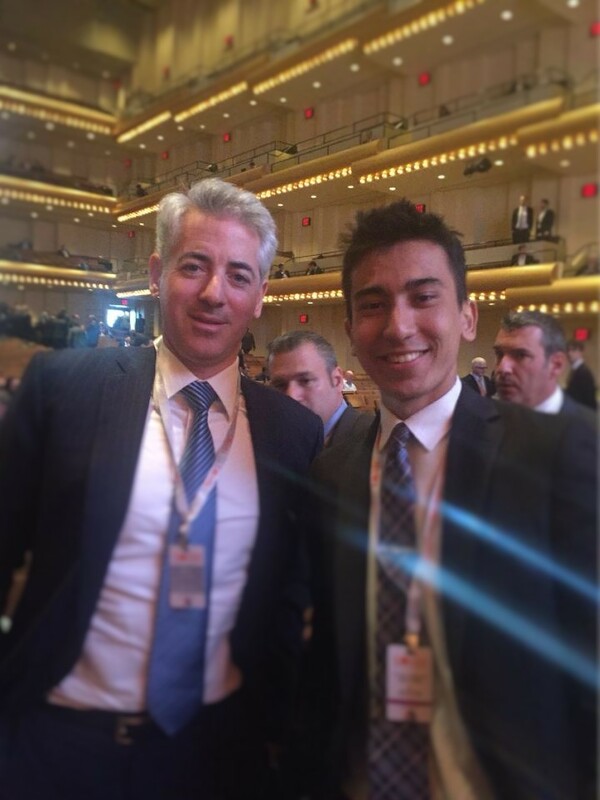 I’m naturally contrarian like Bill Ackman. I love going against the crowd. I love Bill Ackman. When I met him, I had no problem keeping my cool after learning my lesson from the Ben Bernanke experience. Being contrarian has made me money. It has also got me into “value trap” like buying $TWTR around $34. The UK labor market survey was released a day after Bank of England cut rates and expanded quantitative easing. On Thursday (August 4th), Bank of England (BoE) cut rates by 25bps (0.25%) to 0.25%, the lowest since the central bank was founded in 1694 (322 years) and the first cut since March 2009. Carney told banks they have “no excuse” not to pass on the rate cut in full to customers. In other words, he’s telling them not to mess with him. With 6-3 vote, they will provide an extra 60 billion pounds ($78 billion) of newly created money by buying government bonds over six months, extending the existing quantitative easing (QE) to 435 billion ($569 billion). To cushion the blow to banks’ profitability, BoE will provide up to 100 billion pounds ($130 billion) of loans to banks close the base rate of 0.25% under the Term Funding Scheme (TFS). The scheme will charge a penalty rate if banks do not lend. I did not expect that much of stimulus. While I was wrong on this one, I was right in July when markets expected rate-cut and expansion of QE. Note: I’m always active on Twitter. Follow me, @Khojinur30. The stimulus comes as recent economic data has been weak. Confidence tumbled. Manufacturing, construction activity, and service-sector all shrank sharply. Consumer confidence dropped 11 points to -12 in July, the sharpest month-to-month drop (M/M) since March 1990. 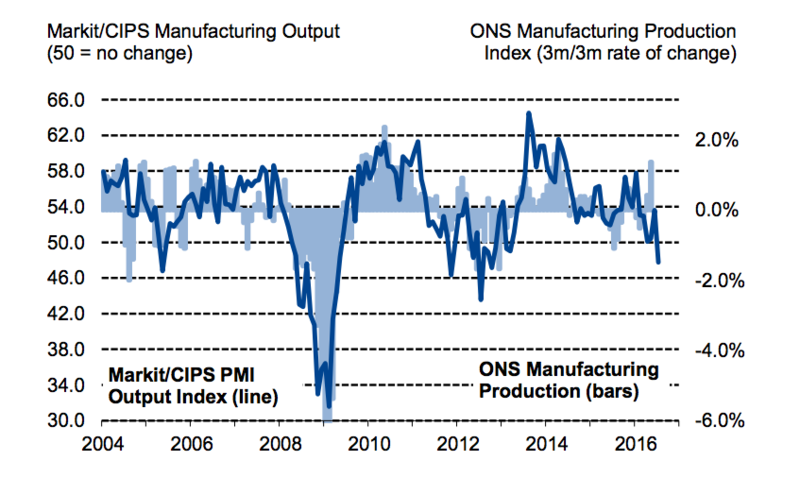 Activity among UK manufacturers contracted at its fastest pace at the start of third quarter. 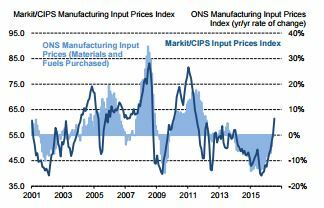 UK manufacturing PMI (Purchasing Mangers’ Index) fell to 48.2 in July, down from 52.4 in June, the lowest levels since February 2013. Manufacturing sector accounts for 11% of the UK economy. Employs 2.6 million workers, accounting for 8.20% of the working population. “UK manufacturing employment decreased for the seventh straight month in July, the rate of job loss was the second-sharpest for almost three-and-a-half years” the PMI report said. Contributes to 10% of GVA (Gross Value Added), which measures how much money is generated through goods and services produced. In 2014, GVA per head on average in the UK was 24,616 pounds ($32,113), growing 3.6% Y/Y. Accounts for 44% of total exports. Exports alone account for 27.4% of the UK’s GDP (Gross Domestic Product). Export orders rose for the second successive month in response to the weaker pound. On July 6th, sterling plunged to $1.2788, the lowest since 1985. Represents 69% of business research and development (R&D), which accounts for mini 1.67% of the UK’s GDP. UK construction industry, accounting for 6.5% (Parliament.uk – PDF download) of the economic output, suffered its sharpest downturn since June 2009 as the sector came under pressure from the uncertainty. UK construction PMI inched down 0.1 to 45.9 last month. Clients of the construction firms had adopted “wait-and-see” approach to projects rather than curtailing and canceling the projects. The same “wait-and-see” that has caused investors like me to sit on cash (Cash on sidelines). “Insufficient new work to replace completed projects resulted in a decline in employment numbers for the first time since May 2013” the PMI report stated. The construction industry accounts for 2.1 million jobs, 6.62% of the working population. The industry contributes to 6.5% of GVA. And services too. 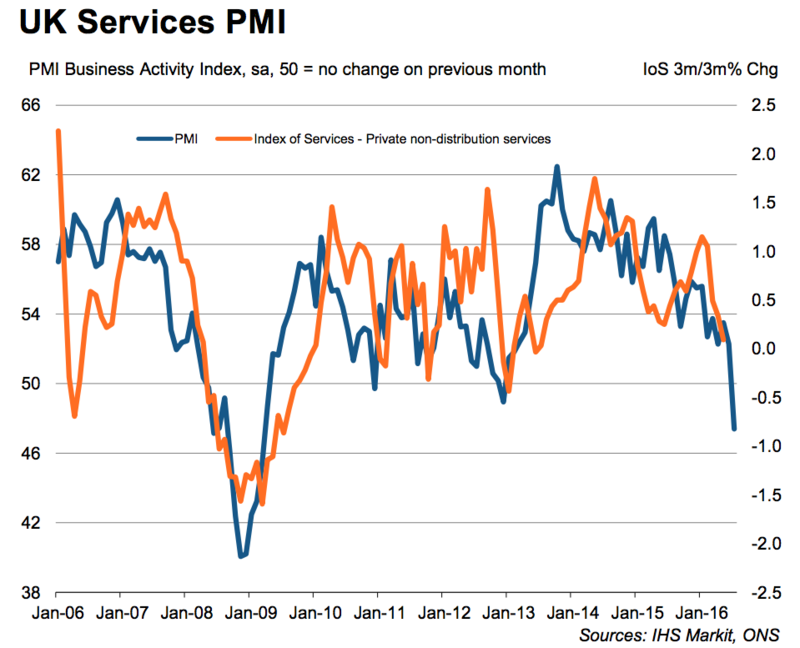 UK services PMI plunged to 47.4 in July from 52.3 in June, the first contraction since December 2012 and the fastest rate of decline since March 2009 and the steepest M/M decline (-4.9) since PMIs began in July 1996. The sector accounts for 78.4% of the UK economic output. Not surprisingly, the sentiment of businesses dropped to the lowest since February 2009. Bank of England slashed its growth and increased its inflation forecasts. The central bank slashed its growth forecast for 2017 to 0.8% from initial estimate of 2.3%, making it the biggest downgrade in growth from one inflation report to the next. They now expect inflation to hit 1.9% in 2017, from previous estimate of 1.5%. For 2018, the economy is expected to grow at 1.8% from previous estimate of 2.3%, and CPI is expected to hit 2.4% from previous estimate of 2.1. Unemployment is expected to reach 5.4% next year from initial estimate of 4.9%, that is more than 250,000 people losing their job….even after the stimulus. The bank’s outlook also includes lower income and housing prices to decline a “little” over the next year. UK house prices fell 1% in July, according to a survey by Halifax, Britain’s biggest mortgage lender. The reports for the next few months will sure be interesting. Confidence will continue to fall in the coming months as uncertainty will continue to exist and businesses will be extremely cautious with regard to spending, investment and hiring decisions, and people will be cautious with regard to spending. All these survey conducted shortly after Brexit reflects an initial reaction. What matters now, especially after the new wave of stimulus, is the level of uncertainty and the magnitude of contractions. The three PMIs – manufacturing, construction, and services – accounting for almost 96% of the economic output, does not cover the whole economy as the retail, government and energy sectors (Oh energy), are excluded. However, it is clear the UK economy is slowing and is likely to slow in the coming quarters. Until clouds stop blocking the sun from shining, we won’t have a clear picture of the economy. Will there be a recession or not? I’m not calling for any recession at the time. I will get a better idea of where the UK economy is heading as we get more data. Consumer Price Index (CPI) – With data reflected in the PMIs and the amount of stimulus announced by BoE, inflation overshoot is possible. This report in two weeks will only reflect July. We should get better of where inflation is going in September and October. Another manufacturing and construction PMIs. 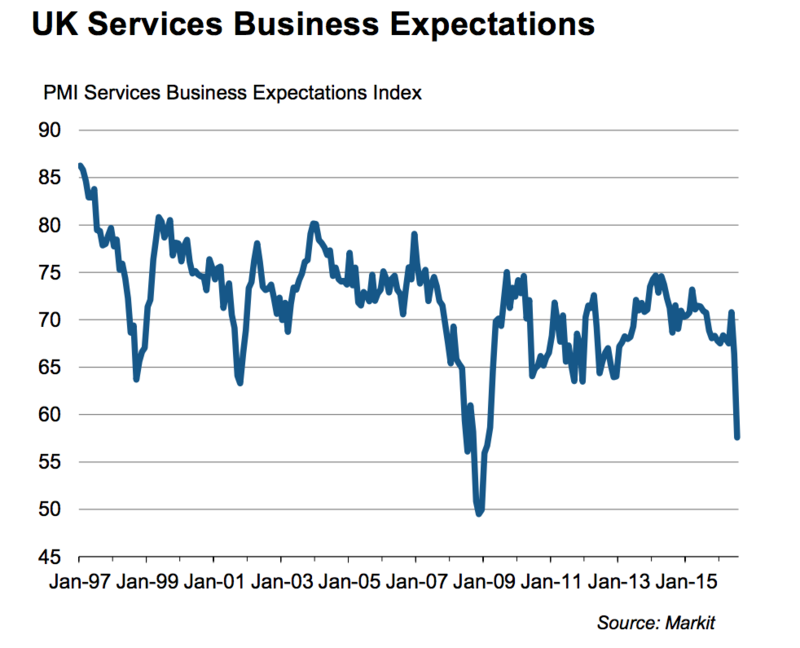 The services PMI comes the week later. I should make a call on whatever the will be recession after the data and some by mid-September. Without fiscal stimulus, monetary stimulus alone cannot offset most of the Brexit ills. Philip Hammond, the chancellor, signaled loosening of fiscal policy in October. By then, it just might be too late. Before I go any further, let me tell you what led to Cisco in the first place. I strongly believe in technology and Internet of Things (loT). I believe the market will increase significantly as there are unlimited demand for it and will continue to have unlimited demand. 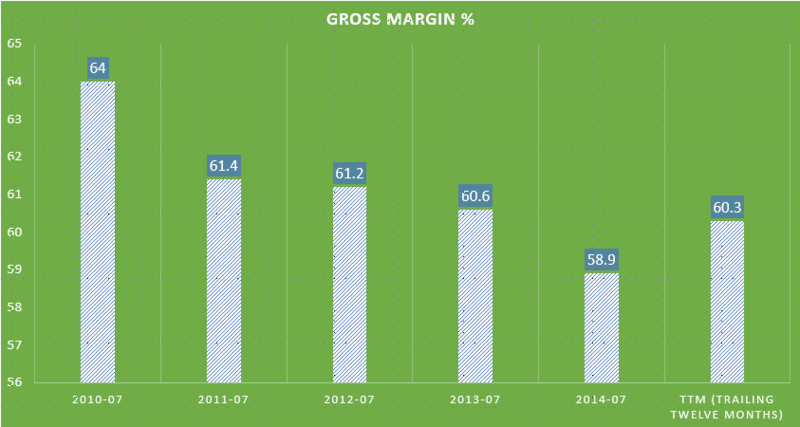 Cisco’s gross margin, operating income, operating cash flow, and total cash are strong and of course impressive. As of April 25, 2015, Cisco had almost $54.5 billion cash on hand. 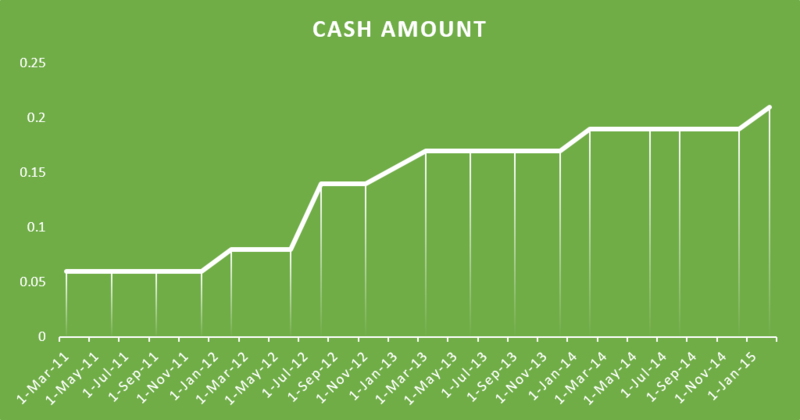 If you look at the “Total cash” chart below (Cash as of April 2015 not shown), you will see that Cisco had slightly over $52 billion cash as of July 2014. In a year, they managed to increase their cash about 5%. Over the last five years (2010-07 to 2015-04), they managed to increase their total cash amount by 36.25%. For company that’s so large and has a market capitalization of $136.9 billion, total cash appreciation is pretty impressive. As of April 25, they had current assets of $69.4 and total assets of $106.2 billion. They have total liabilities of $47.4 billion. With strong amount of cash and assets, liabilities are not an issue and should not be in the future as the company continues to trim down liabilities. Over the 10 years, operating income has increased significantly while both operating cash flow and working capital has doubled. 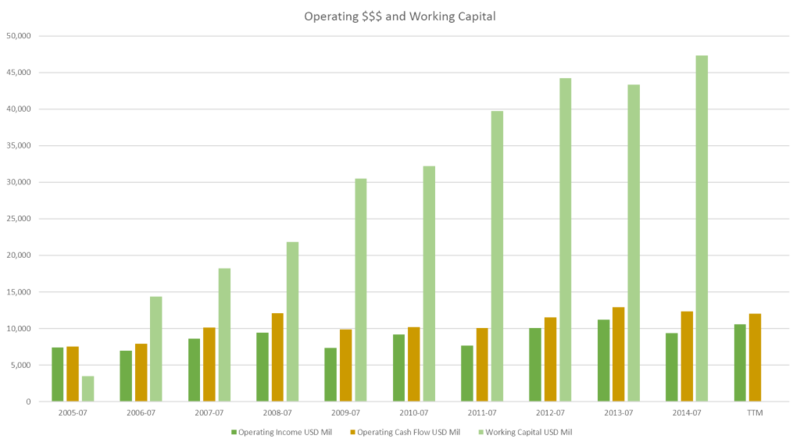 It shows that Cisco cares about longer-term success instead of focusing on short-term maximization. Long-term investors will benefit from the minds of the management. Below, you see a Comparable Company Analysis chart. I chose one major peer, Qualcomm. The reason I only chose Qualcomm is because all other peers such as Juniper Networks and Palo Alto Networks are too small. During the 3rd quarter of fiscal 2015, Cisco paid a dividend of $0.21 per share, or $1.1 billion. As of today, the divided is still the same. However, it’s expected to increase in the future. They pay a dividend of $0.84 annually, or 3% yield. In the same quarter, Cisco repurchased approximately 35 million shares of common stock under the stock repurchase program for an aggregate purchase price of $1.0 billion. The remaining authorized amount for stock repurchases under the program is approximately $5.3 billion with no termination date. I believe they will issue new share buyback program after the current program ends, probably in about five quarters if they keep spending approximately $1.0 billion each quarter. I love that Cisco is aggressively buying back stock. Not only that, but they pay divided to their shareholders which I expect to increase in the future. Conclusion: From my analysis on Cisco, I have my stock price targets. By 3rd quarter of fiscal 2016: Net income from 3Q fiscal 2014 to 3Q fiscal 2015 grew 11.74%. Let’s assume, it grows 5% from 3Q fiscal 2015 to 3Q fiscal 2016, net income would be $2,558.85 (in $billions), or GAAP EPS of $0.50 ($0.4971 to be exact). It would be $0.03 EPS increase year-over-year. When Cisco buys back shares, EPS will be higher depending on the amounts of shares purchased back. Now, let’s assume GAAP EPS for the next 3 quarters stayed the same as 3Q fiscal 2015 which is at $0.47. After the 3Q fiscal 2016, Cisco would have EPS (TTM) of $1.91. At the current share price, the P/E ratio would then be 14.82x. But at this rate of growth, $CSCO would be worth $32, 13% higher than current price ($28.32), at P/E ratio of 16.75x, just 2.82% higher than the current P/E ratio of 16.29x. My target price might change when Cisco reports 4Q fiscal 2015 earnings on August 12, 2015. I expect better than expected results. US Dollar (greenback) strength might hurt foreign sales. About 40% of their sales are aboard. 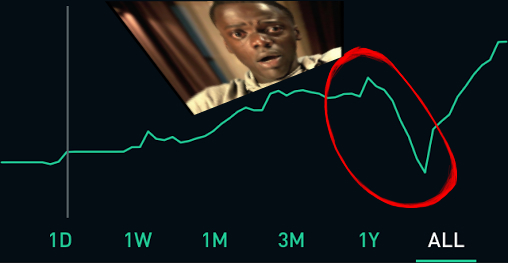 Disclosure: I’m currently long on the stock, CSCO. I went long last year at price just below $25. I will continue to be long. Note: All information I used here such as revenue, gross margin, etc are found from Cisco’s official investor relations site, Bloomberg terminal and morningstar. The pictures you see here are my own. 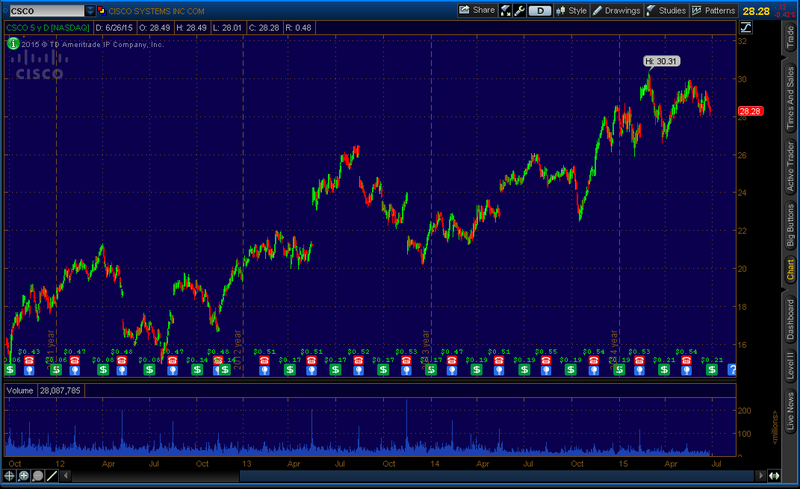 Cisco (NASDAQ: CSCO) – networking giant – designs, manufactures, and sells networking equipments. Founded in 1984, Cisco has grown exponentially over the years. In May, Cisco announced that Chuck Robbins will be the new Chief Executive Officer (CEO) effective July 26, 2015, replacing John Chambers who will assume the role of Executive Chairman and will continue to serve as the Chairman of Cisco’s board. John Chambers is confident Chuck Robbins will continue the positive momentum. I, too, am confident because Chuck Robbins has a great history. In the past, Robbins has been Senior Vice President (SVP) of Worldwide Field Operations, SVP of the Americas, SVP of Worldwide Sales, SVP of US Enterprise, SVP of Commercial Business, Head of North American Channels, Group Vice President (GVP) of US and Canada channels, and has been a Director of Cisco since May 1, 2015. Chambers stated “Chuck’s vision, strategy and execution track record is exactly what Cisco needs as we enter our next chapter, which I am confident will be even more impactful and exciting than our last.” Well, I’m also confident that Chuck will do a great job at Cisco, benefiting shareholders. For someone who has been committed to Cisco for a long time, and held high level roles, I believe he’s the right person for the job. He will be ethical and care about the longer-term at Cisco, instead of short-term maximization. On May 13, 2015, Cisco reported third quarter earnings and it was relatively strong. Revenue was $12.1 billion, increase of 5% year over year. Net income was $2.4 billion or $0.47 per share on Generally Accepted Account Principles (GAAP), up from previous fiscal year third quarter earnings of $2.2 billion or $0.42 per share. Revenue for the first nine months of fiscal 2015 year was $36.3 billion and net income, on a GAAP basis, was $6.7 billion or $1.29 per share, compared with $34.8 billion revenue and $5.6 billion or $1.06 per share for the first nine months of fiscal 2014 year. In 5-year average, Cisco’s revenue and net income has been growing at more than 5%. For company that is so large, 5-year average growth rate is pretty impressive. Not only revenue and net income are impressive, but also gross margin, operating income, operating cash flow, cash on hand, and dividends. Note: All information I used here such as revenue, gross margin, etc are found from Cisco’s official investor relations site, and Bloomberg terminal. The pictures you see here are my own. Last Monday (February 2, 2015), Reserve Bank Australia (RBA) cut rates to 2.25% from 2.50%, record low. On my post “Now, Bank of Canada (Boc) Shocks by rate cut. Who’s next?”, I predicted RBA was going to be the next central bank who will cut the rates. If you have not read it, feel free to go to the post. Immediately after the announcement, Aussie fell about 100 pips. In the statement by the Governor of RBA, Glenn Stevens, “The Australian dollar has declined noticeably against a rising US dollar over recent months…remains above most estimates of its fundamental value, particularly given the significant declines in key commodity prices. A lower exchange rate is likely to be needed to achieve balanced growth in the economy.” They are basically saying that Aussie is little stronger and needs weaker currency to help their economy grow. In the same hour RBA announces rate cut, AUD/USD dropped all the way to 0.7651, lowest since May 2009. After dropping almost 200 pips, the next day was total opposite. In the next day, Aussie absorbed all of the loses, due to short squeeze in non-dollar currencies and rise in oil prices. 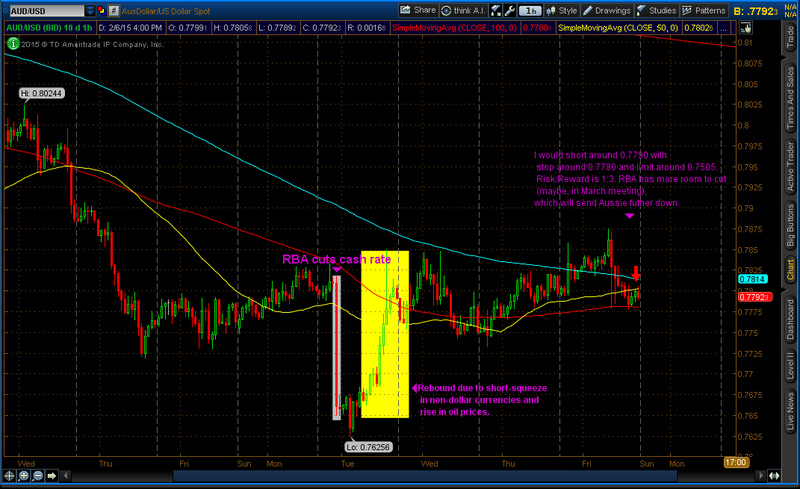 The rebound in Aussie is a perfect sell opportunity. I believe, in the six months, AUD/USD will drop over 300 pips, under 0.7500. Last Thursday (February 5,2 2015), RBA released its quarterly Monetary Policy Statement, signaling another rate cut coming in the way. RBA lowered its 2015 growth and inflation forecasts. In November, they expected expansion between 2% and 3%. Now, they are expecting 1.75% and 2.75% (lowering by 0.25%). They also predicted that unemployment will rise. I believe another rate cut is coming this year. But, the question is “When?”. 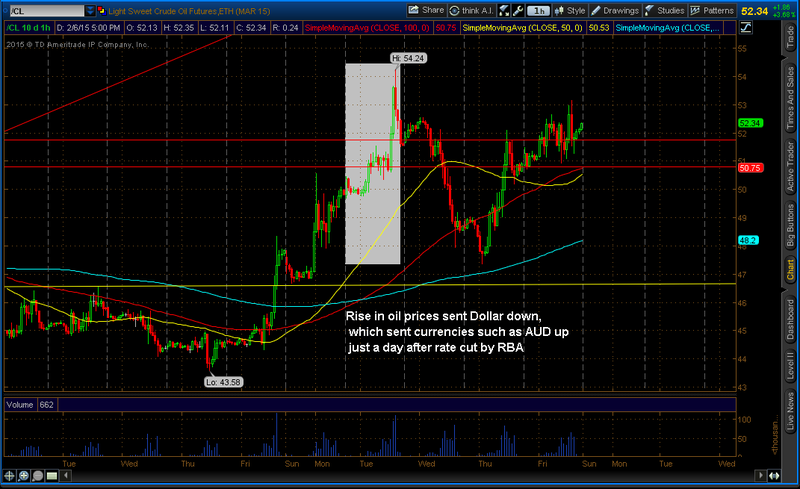 Again, rebound in AUD/USD is selling opportunity not to be missed.